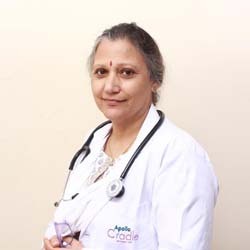 She completed her MBBS from Indira Gandhi Medical College in 1986 and DGO – Aligarh Muslim University in 1992. She has around 21 years of experience in similar role. Area of Interest in High risk pregnancies and preventive Gynaecology. Can communicate in Tamil,Kannada and Malayalam. I would take all the privilege to appreciate Dr. Vibha for providing me intense care and support during my pregnancy. She was all the time available for answering my queries. I really feel so fortunate to have delivered my baby at Apollo Cradle. The best hospitality and credibility are the assests owned by all the team at Apollo Cradle. Thank you again! Extremely good service from housekeeping, front desk, nurses and last but not the least, the doctors. Everyone is professional and very cooperative. They put a patient’s needs first. Thanks to everyone in the team, especially my doctor, Vibha Rathor. Whether it were the doctors, nurses, or front desk staff, the service all across was good. My doctor, Vibha Rathore was experienced, patient and very supportive. It was a good decision to come here for my delivery. Our doctor, Dr. Vibha Rathor was very professional, knowledgeable and patient. Along with all the support staff, our experience at Apollo Cradle was very good overall.